Before starting your search about best OneDrive Mac solutions or OneDrive for business Mac apps, we would recommend you, first of all, to get to know more information about this service as well as using OneDrive on Mac. In the article below you would find answers not only to highly asked questions but also would find rather interesting information about Microsoft OneDrive. So, let’s start. So, what is Microsoft OneDrive? Not so long time ago this service was called "SkyDrive". However, as there was a lawsuit between Microsoft and another company that was lost, the prefix Sky had to be removed, replacing it with One. Although, the service itself did not suffer at all from this rebranding. Despite the fact that file hosting has been running for more than ten years, not a lot of people use OneDrive… or even have heard about it as well as know about its existence because of the paradoxical for Microsoft small popularity and lack of ubiquity by consumers. 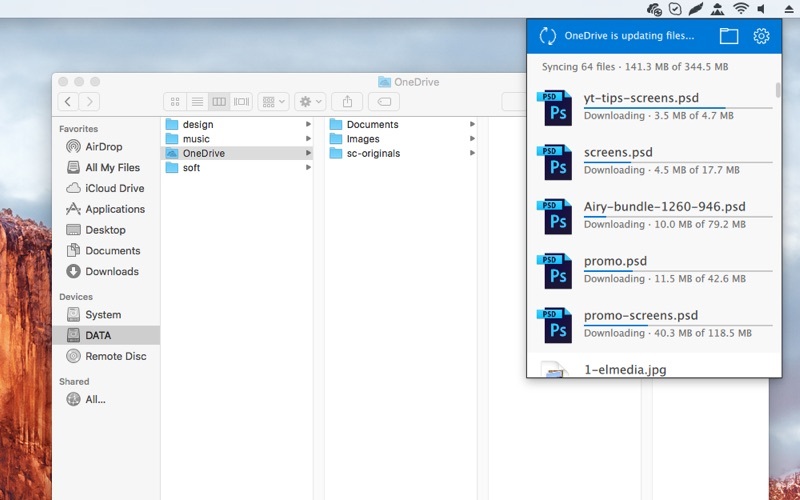 For a lot of users, Microsoft OneDrive is an unfamiliar field and there is no wonder that a great number of users even do not know how to use OneDrive on Mac. It goes without saying that Microsoft OneDrive applications have been developed for fast access for all major platforms on both PCs and smartphones. Despite this fact, Microsoft OneDrive has almost everything that its competitors have in its arsenal (5 GB of free space in the file storage and up to twenty-five GB to those who have access to free updates, the ability to view the history of each object change, the shopping cart, desktop program and much more). Also, in addition, OneDrive (or as we also know SkyDrive) has its own advantages, for example, such as working with office documents right in the interface of file hosting, and we are not talking just about viewing option but also OneDrive offers editing option. For your convenience, we have prepared a brief tutorial about using OneDrive on Mac. Of course, the first thing that every user should do is to setup OneDrive. Below you will get the step-by-step guide in order how to do it. The last step is to create OneDrive folder on your hard drive upon a request. Thought it would be rather difficult? Well, as you can see, it is not. The whole process is rather simple and straightforward that wouldn’t take you a lot of time. OneDrive Storage "Files" is a basic opportunity to work with folders and files on the cloud. You can create a new file or folder, download them from the hard disk and sort them. "Recent" folder stores the history of using the service, both downloads, and editing in online versions of programs. "Photos" folder automatically detects all photos on the disc, supplies them with tags and sorts them according to the date of the shooting. "Shared" folder contains all files for which access was granted. Users who have received a link to them can get a view only access to the files. The rights to remove or change the data are not provided. The “Recycle Bin” is not of much interest. Its tasks are similar to the OneDrive desktop app version. The only difference is that by default the time it takes to store the files that you want to be deleted is only one month. By default, your OneDrive folder has 3 folders, namely "Documents", "Pictures" and "Shared with me”. There are no restrictions in organizing your OneDrive storage. You can seamlessly add other folders and, if it is needed, change their hierarchy. In order to upload any files/folders to Microsoft OneDrive, you need to drag-and-drop them into the selected folder. Now, it will not make difficulties to access the info from any computer or device with OneDrive client installed on it. As an option, you can always access your data via the web interface. OneDrive app for Mac can be rather useful iа you want to see version control. In case if you have shared files with your coworkers and made some changes, with this service you would be able to track who made the changes thanks to “Version History” option in the menu. In addition, OneDrive can work as the default documents folder allowing you to automatically sync any kind of data (notes, documents, photos) to this cloud service. In case, if you are for saving space on your hard drive, there is so-called “Selective Sync” option. With its help, you can define what kind of data/folders should be synced on your computer and on OneDrive. In case, if you are worried about your hard drive storage space, we would recommend you to take a look at CloudMounter, OneDrive client for Mac, developed by Eltima Software that allows you to access your cloud data absolutely hassle-free. The most important thing about CloudMounter is that, unlike native OneDrive Mac client, the app doesn’t sync any of your files to the local drive, unless you choose to open them. Instead, with the help of CloudMounter, you can effortlessly mount the service on your Mac and work with online files directly. It is also worth noting that CloudMounter is an excellent OneDrive for Business client for Mac, as well as it supports other popular cloud storages and remote servers. We really hope that our tips would help you master OneDrive and who knows maybe it would become your number one cloud storage.